At WALT Wines, we are committed to offering safe and affordable shipping options for your wine purchases. Read on for more information regarding our shipping programs. Feel free to contact our Membership Associates at info@waltwines.com or (707) 933-4440 with any further inquiries. Depending on where the wine is being shipped, ground delivery can take up to 1 week. Our shipping notifications will let you know when your package will be coming so you can sign for delivery. Please note, there are some exceptions to this shipping offer including shipments to Hawaii and Alaska. Keep in mind orders may be held until the summer heat passes to ensure that your wine arrives in pristine condition. Consider Priority Overnight or summer temperature controlled shipping, if you would prefer delivery during the summer months. Need your wine in a hurry? During the summer we offer substantially discounted express shipping rates. The cost is $40 per case and an additional $20 after the first case. We invite you to visit WALT Sonoma to pick up your wine order if it is most convenient for you. Who wouldn’t want to want an excuse to swing by for a tasting? Each state abides by a different set of wine shipping rules and regulations such as the amount of wine that can be shipped. Some states even restrict wine shipments completely*! Our checkout process will alert you if we cannot ship your order as a result of it not being compliant. Our Membership Associates are here to ensure that all orders are compliant and they are available to help navigate the shipping rules in your state. 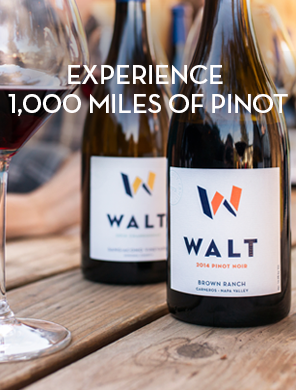 Do not hesitate to reach out with any questions at info@waltwines.com or (707) 933-4440.